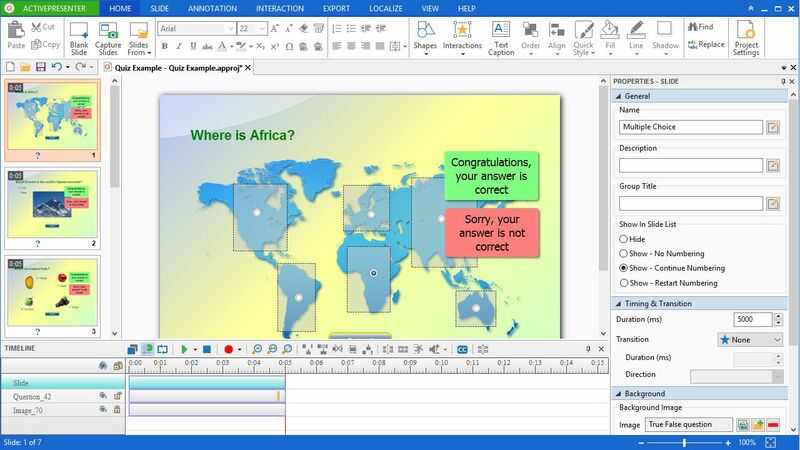 Create videos, handouts, manuals, training contents in HTML5, Flash. 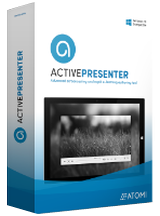 Active Presenter Pro 5.5.3 was available as a giveaway on November 30, 2015! 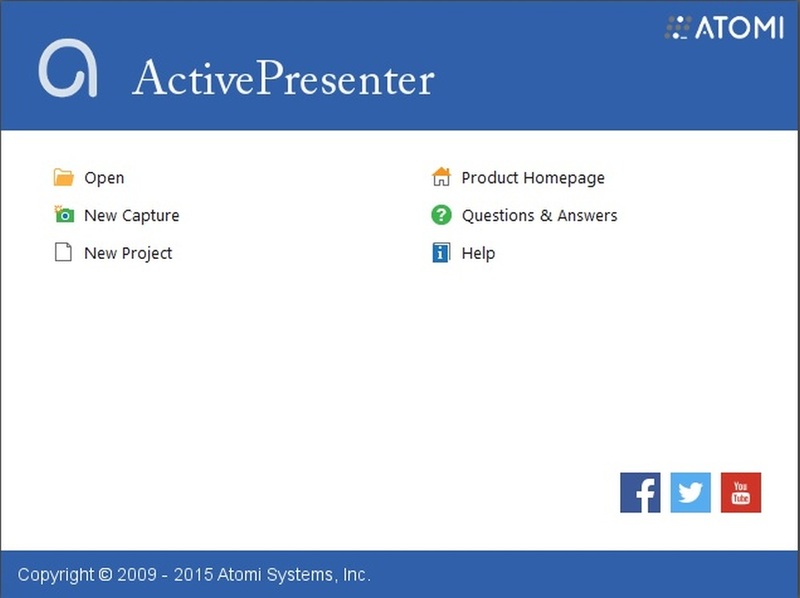 ActivePresenter is a tool for creating screencast videos, handouts, manuals, and interactive training contents in HTML5 or Flash. With a powerful editor, ActivePresenter allows you to embed and edit multiple audios/videos, annotate and tweak the look, define branched scenarios easily and effectively. 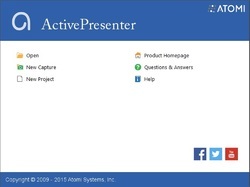 Supporting HTML5 and the ability to integrate with SCORM-compliant LMS, contents created with ActivePresenter can be transferred virtually to any devices and platforms. You can also convert your content to many output formats with just a few clicks: Video (MP4, AVI, WMV, MKV, WebM), HTML5, Flash, PDF, Word, PowerPoint. Please note: Get one commercial 3-volume license for each of the top 3 suggestions in the Idea Informer Widget. This license can be used to activate ActivePresenter Professional on 3 computers (Office, Home PC and laptop) at a time. 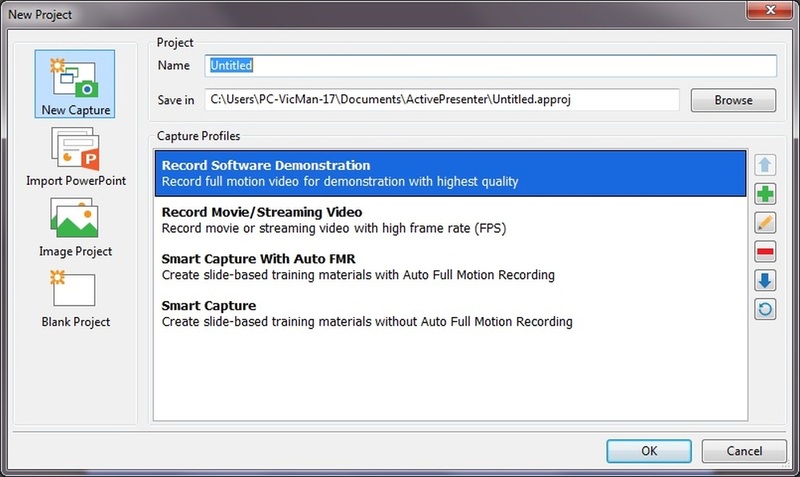 How would you improve Active Presenter Pro 5.5.3? OGG, MP2, APE, OPUS, CAF, VOC, etc. You may try Avdshare VideoGo to increase the Sound volume of a video or audio file Working as an Audio Volume Booster, Avdshare VideoGo can easily boost sound volume for almost all kinds of audio file like increase MP3 volume, increase WAV volume, increase FLAC volume, increase AAC volume, increase AC3 volume, M4A, WMA, AU, DTS, AIFF, OGG, MP2, APE, OPUS, CAF, VOC, etc. I haven't had the time to test it properly, but it seems a great program from what I've seen. And it's $0 instead of $299, so a super bargain. The Automatically Check for Updates button was not grayed out in Preferences; I was able to uncheck it. The activation process uses the IE engine even when using another browser. Installed perfect on Win8.1 (x32) Easy activating & registration. Works perfect so, deffo a keeper. Sad to see that this program has a long way to go. It has many functions, but if you add functions without removing previous errors you get a product were the consumer has to work around errors constantly. That is not a workable situation. I´ve only looked at creating (interactive) html5 output. It should be able to produce a complete digital exam, but I got caught in a maze of closed doors because of programming errors. Producing html5 code with this program is trial and error, and creating an advanced interactive quiz proved to be impossible. It could use a lot of updates. Sad to see that this program has a long way to go. It has many functions, but if you add functions without removing previous errors you get a product were the consumer has to work around errors constantly. That is not a workable situation. I´ve only looked at creating (interactive) html5 output. It should be able to produce a complete digital exam, but I got caught in a maze of closed doors because of programming errors. Producing html5 code with this program is trial and error, and creating an advanced interactive quiz proved to be impossible. It could use a lot of updates. @Calimero: Can you please tell what are the issues you're having when creating HTML5 output? And some examples of the programming errors you've mentioned? That would be very helpful and much appreciated! Thank you! With objects (like a text or a multiple selection object), the autofit option is automatically selected, but this goes wrong: the output shortens lines like they were outside an objectwireframe. So you have to manually adjust every boxed object (every question and answer too), deselect autofit, resizing it, and hope for the best... that takes a lot of trial and error. When adding a textbox, it is centered, while the button left-aligned is on, it is annoying to correct this every time, just like erasing the standard text that is placed (could be greyed out and deleted after the first letter that is put in that place). In the export section, you can choose between PNG and JPG format; it only converts pictures to png, you can set it to jpg and slide the jpg compression but it won´t work. Furthermore the HTML5 player has controls in most themes but I could not get any control to work. That are just a few thing I came across. But cannot find the file anywhere. I have ran revo uninstaller in the hope of finding where this file is. If it is this hard to find I have to question how good can the thing be? I would uninstall. IF I could find it. Waste of time. I got this: Register your copy using following data: Registration key:.... But cannot find the file anywhere. This is the first time ever that I have not been able to find an 'installed program' I have ran revo uninstaller in the hope of finding where this file is. It is not showing. If it is this hard to find I have to question how good can the thing be? I would uninstall. IF I could find it. Waste of time. Downloaded, extracted and tried to install on Windows 7/64 bit. Got Windows error message about bad install. Tried again, no joy. Had a similar problem with an earlier GOTD offer which was solved by booting in Safe Mode w/networking and doing the install there. That technique worked with this program also. No problems registering as initial toolbar had a button to activate product. Doesn't install. Installed something called "informer." It says it downloaded something, but does nothing. Uninstalled "informer" and now nothing happens when I re-download and install from the link. Suspect you are seeing "software informer", that is an optional install that comes from GOTD rather than the Program's author. Installed without problem on Win 8 laptop. Happy to see the issue in my version (4) of locking up if I started a 2nd capture before saving the previous capture and closing the program. I'm a little confused by what capabilities today's GAOTD version should have versus the Freeware / Shareware described in the EULA. I installed on Win 8.2 without difficulty. But when I go into Help to activate it I see Deactivate Product as if it already came registered. Is this correct or do I need to do something with the registration key that I was provided? Looks to be a valuable program that I'd hate to lose over a registration oversight. I installed on Win 8.2 without difficulty. But when I go into Help to activate it I see Deactivate Product as if it already came registered. Is this correct or do I need to do something with the registration key that I was provided? Looks to be a valuable program that I'd hate to lose over a registration oversight. @Bill: If you see Deactivate Product button then that means ActivePresenter somehow sees it as already activated. Please double check by closing it and running it again, then go to the Help tab > About dialog to make sure that you see the edition is Professional. You can also make an additional quick check by creating a short & simple project and export to HTML5, if there's no watermark then it's actually activated. @Hollie "non-commercial usage" normally means you cannot use it to create anything you will be making money from or being paid for. It seems to have installed fine but when I try to go to Help file to register it, the Help file won't even open. Sure is a hard one to register. Installed without a problem on Win 8 (x64). Desktop icon there, program resides in Programs(x64) folder. I noticed that in order to activate, it needed a connection to internet. For those not finding an icon or program, did you have your internet available? What does it mean by non-commercial usage? Can I use it to record some basic instructional video and upload on youtube or use it for a free membership site? What does it mean by non-commercial usage? Can I use it to record some basic instructional video and upload on youtube or use it for a free membership site? Thanks! Non-commercial use generally means you can't use it to make money, directly or indirectly. Downloaded zip file, unzipped then ran setup.exe file. Installation process gave no indication where program was to be downloaded to but eventually got a screen stating it had been installed and giving an activation code. Cannot find any new icon on desktop, cannot find program in Program Files folder - where is it?? Get the following message on start, "Failed to initialize multimedia library. Audio/Visual related features will not function properly". Have Windows 10 64bit on my machine. Any suggestions? Removing and then re-installing audio drivers may help in this case. cannot find on PC win 7 x64 after activation what am I missing? I have exactly the same problem...Installation seems to have gone successfully but no icon, not listed in "all programs". I have no idea where to find this program on my computer . Same happened to me - I even got as far as getting confirmation that the program had been activated but cannot find it anywhere on my system. In your Program Files folder, if you clicked to activate the program using its default settings, look for a subfolder titled Atomi/ActivePresenter. I agree... not apparent where to activate, and took a long minute to find. Top border select help pin, look to the right, and you'll see an activate pin. select that to get the popup to insert.paste the key. I agree... not apparent where to activate, and took a long minute to find. Top border select help pin, look to the right, and you'll see an activate pin. select that to get the popup to insert.paste the key. A keeper yet a few tweaks and additions are left to be desired. Some of which are mentioned Idea Informer (feedback) above. Great tools offered here. yet it is not the most intuitive program.The main thing this program is lacking is a full tutorial video on a program that's main purpose is to create tutorial videos and presentations. A keeper yet a few tweaks and additions are left to be desired. Some of which are mentioned Idea Informer (feedback) above. Great tools offered here. yet it is not the most intuitive program.The main thing this program is lacking is a full tutorial video on a program that's main purpose is to create tutorial videos and presentations. For testing purposes, I uploaded an HTML5 simulator to a website and it worked seamlessly. A direct ftp upload option is missing though. I've been using this program for a few months. It works flawlessly and if you have any interest in what it does, is a very worthwhile d/l and install. Many programs dont allow to desect updates unfortunately. The possibility is greyed out by the publisher. "To the 8 people that gave it a thumbs down..." - yes, yes - there are hundreds... But since weeks is this statistic a big fake. Installed on windows 10 x64. Nice simple and quick install, however for me the progress bar reached 100% and the installation was still installing for approx 20 seconds. Looks simple to use, had the standard office type of interface. Lots of examples from their home screen, under the demo tab. A quick basic test went ok. A keeper for me. Removing and then re-installing audio drivers may work. There is a discussion about this issue here. Hi NYB, Removing and then re-installing audio drivers may work. There is a discussion about this issue <a href="http://atomisystems.com/community/8834/failed-initialize-multimedia-library-video-functions-windows?show=8834#q8834" target="blank">here</a>. Always happy for your advice. I have been missing you! What an amazing piece of work today's download is; created a slideshow in which each image has its own audio, plus! Inset in the first image along with the audio a video created in Google Earth, the programme did this without the slightest difficulty and produced outstanding quality. I think this is without doubt the most amazing piece of software I have ever downloaded from this site. My regards to the developers of this program, as a developer myself am truly amazed and full of admiration. What an amazing piece of work today's download is; created a slideshow in which each image has its own audio, plus! Inset in the first image along with the audio a video created in Google Earth, the programme did this without the slightest difficulty and produced outstanding quality. I think this is without doubt the most amazing piece of software I have ever downloaded from this site. My regards to the developers of this program, as a developer myself am truly amazed and full of admiration.